Arnoff Global Logistics' warehousing and distribution division provides you with a strategic advantage to your logistics processes. We eliminate unnecessary distribution steps and offer immediate delivery to any point in the entire Hudson Valley Region and Capitol District of New York through our own distribution facilities as well as any point in the United States, Canada and Internationally though our trusted network of over 200 service providers. We prove safe, secure, accessible and flexible storage for any type of product you might have. Our warehousing and distribution affords you the opportunity to keep expenses to a minimum while offering your customers the advantage of guaranteed overnight delivery. This delivery is accomplished through your own vehicle or by utilizing Arnoff's fleet of more than 100 trucks. Our warehouses are structured to allow you to utilize as much or as little space as your needs require. Bar Coded inventory system with online web portal access for our customers. Our warehousing and distribution objective is to provide the service of storing, handling and inventory control for all types of equipment, furniture, high-value products and highly sensitive shipments. Our services are performed to meet our client's requirements and specialized programs for distribution and security have been developed. Our warehousing methods are constantly reviewed and new techniques are integrated continually. 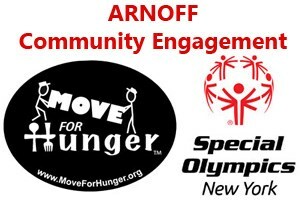 Arnoff is proud to service New York's Hudson Valley, Massachusetts, Connecticut and the Fort Pierce area in Florida for their warehousing and distribution needs.